We had to design an entirely new bearing for this guy. It is about the same size as a one inch headset bearing. Bigger than anything else out there. A high strength, 110mm, one piece aluminum axle is capped with 2 stainless steel axle biters to hold onto your fork legs like crazy. Why a one piece axle? Some other hubs require that you adjust the hub bearings by clamping the fork legs together harder, while others have no adjustments at all. You want strong? Looking for reliability and ease of adjustment? Look no further. 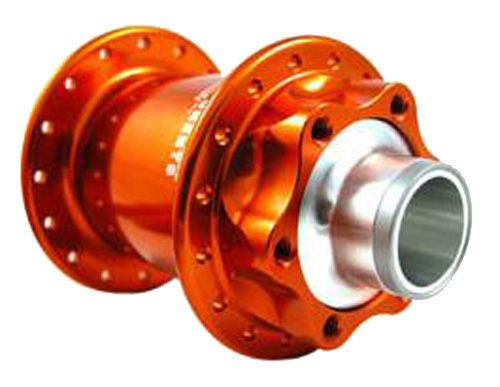 The 20mm Thru Axle Front hub is compatible with the ISO disc standard.